Shifting negative attitudes towards ageing, the elderly, death and dying is a social challenge and key to an effective aged care workforce strategy. There has been no shortage of inquiries into the aged care system over the past few decades. That shocking systemic problems of neglect and abuse remain, as revealed by the ABC’s recent Four Corners expose, highlights the failure of government and industry to act on the recommendations arising from these investigations. We can only be optimistic that the royal commission into the quality and safety of aged care will help change that. A royal commission will capture the public consciousness in a way other inquiries have not. It will document hundreds, if not thousands, of individual stories. Its proceedings will lead to extensive media coverage, and invite a national conversation. Its recommendations should prove harder for governments to shelve. But there is no reason for government and industry to wait years for the royal commission to hand down a report. They can act now to make real progress, based on what we know already. Three months ago the Aged Care Workforce Strategy Taskforce, which I chaired, delivered its report on ways to improve aged care. Based on listening to thousands of people throughout the aged-care sector over nine months, our report outlines 14 areas for action to support Australia’s aged care workforce in their essential role of caring for some of the frailest, most vulnerable members of society. There is no need to wait on making the changes our report recommends. By acting immediately, meaningful strategic reform can be implemented within the next three years. It can make a real difference to the quality of aged care well before the royal commission has completed its work. The aged care industry is fragmented, made up predominantly of small to medium enterprises spread across community, home and residential care settings. It relies on a diverse workforce under pressure from rising expectations and other changes much outside its direct control. Our report’s central recommendation is the need for the aged care industry to embrace a voluntary code of practice. This code can help focus the minds of care providers on standards, workforce practices and commitments to quality and safety. This in turn will focus attention on the need to attract and retain committed, high-quality staff. We are pleased the industry has embraced this idea. Industry leaders have also supported initiatives to improve the skills and qualifications the industry demands of its workers. There is a need for the education and training sector to get on board, ensuring graduates have the skills and knowledge that support safe, quality care. One important finding from our investigation is that those in care, and their families, want a more holistic approach to caring. What they don’t want is narrow “clinical” care, one that treats mental health with a pill or judges a meal just on its calories. Well-designed care needs to consider all aspects of health, as well as cultural needs and aspirations around “living well”. There are clear funding implications. To provide holistic care requires changing how money is spent, as well as how much. Simply stated, as a society we have been short-changing the elderly. That is why our first recommendation is the need for a concerted social change campaign to reframe caring and promote the importance of aged care as a work vocation. It begins with understanding that care for older people is broader than organised, professional care. These factors contribute to the perception that aged care is not a career of first choice. The opportunities that ageing and aged care present in terms of employment, research, contribution to the economy and as a driver for innovation also go largely unrecognised. The spotlight the royal commission will place on aged care should help provoke some serious social soul searching. We need a national conversation about our attitudes to ageing. We need to recognise the problems besetting the industry are but a subset of a wider attitudinal problem that has undervalued the elderly. But the royal commission must not be used as an excuse to procrastinate. There are actions now we know we can take. We should take them. Almost half of residents in Australia’s residential aged care facilities suffer from depression. Tonight ABC’s Four Corners will air the first of a two-part investigation into the often shocking treatment of the elderly in aged care homes around Australia. The timing coincides with Prime Minister Scott Morrison’s weekend announcement of a royal commission into Australia’s aged care system. The prime minister said poor standards had led authorities to close one aged centre per month since the Oakden aged mental health home scandal. South Australia’s Oakden facility closed nearly a year ago, following revelations of abuse and neglect dating back a decade. While the terms of reference are yet to be determined, the royal commission will likely look into issues already raised by previous inquiries into the sector. These include the changing demands of Australia’s ageing population, staffing ratios, funding levels and the mental health, well-being and safety needs of nursing home residents. Below are five articles in which our experts have previously explored the complex aspects of Australia’s aged care system, drawing on research which has exposed where the problems are, and have been for some time. Our ageing population, and the focus on helping the elderly stay at home for as long as possible, means by the time people enter aged care they are older and sicker than before. Around half of people living in aged care today have dementia, depression, or another mental health or behavioural condition. In fact, the proportion of older people requiring high care for complex needs, which includes assistance with all activities of daily living such as eating and bathing, has quadrupled from 13% in 2009 to 61% in 2016. Yet there is no legal requirement for all aged care facilities to provide 24-hour registered nursing care. In the article below, Jane Phillips, David Currow, Deborah Parker and Nola Ries explore how today’s nursing home residents have minimal access to quality medical care. 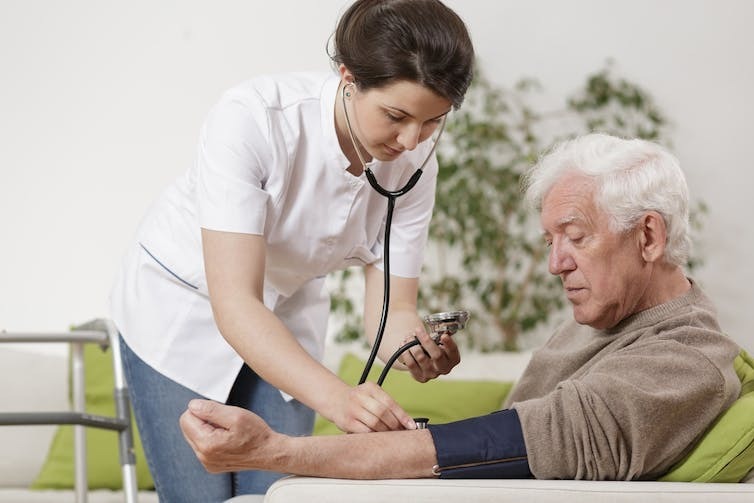 nursing home providers looking to cut costs are bypassing registered nurses and employing less-skilled personal care attendants (PCAs) who aren’t adequately trained for the job. Research consistently shows more people want to stay in their own homes as they age. In the 2018-19 budget, the government announced an extra A$1.6 billion over the next four years for an additional 14,000 Home Care Packages. These deliver an agreed set of services to meet the specific needs of aged Australians who want to remain at home. The government also subsidises a number (currently around 283,000) of residential care places for older people unable to continue living independently. Aged care subsidies are allocated through a ratio, which aims to provide 113 subsidised care places for every 1,000 people aged 70 and over. This ratio will increase to 125 places for every 1,000 by 2021-22. Within the overall number of places, the government also sets sub-targets for the numbers of Home Care Packages and residential care places. The government is aiming to amend the ratio in favour of more home care packages. By 2021-22, the target for home care packages will increase from 27 to 45 per 1,000, while the residential target is to reduce from 88 to 78 per 1,000. But as Professor of Health Economics at University of Technology Sydney, Michael Woods has written, this still won’t be enough to meet demand. Older Australians living in nursing homes represent one of society’s most vulnerable populations. More than 50% of residents in nursing homes suffer from depression compared to 10-15% of adults of the same age living in the community. Recent research conducted by Briony Murphy and Professor Joseph Ibrahim from Monash University’s Health Law and Ageing Research Unit, found around 140 Australian nursing-home residents took their own lives between 2000 and 2013. The authors found nearly 70% of those who took their own life were male, 66% had a diagnosis of depression and nearly 80% were experiencing one or more major life stresses, such as health deterioration. Around 43% were experiencing isolation and loneliness, and nearly 30% had trouble adjusting to life in a nursing home. The small proportion of adults over 65 living with depression in the community shows that depression is not a normal part of the ageing process… the much larger figure of those suffering depression in nursing homes raises some serious questions. Stories of abuse and neglect in nursing homes have also highlighted the issue of poor nutrition and oral health. In November 2017, the dire state of this was shown in a report of a nursing home resident in NSW who was found with maggots in her mouth the day before she died. Researchers have long highlighted people living in aged care have substantially poorer oral health and three times the risk of untreated tooth decay than people living in the community. …or helping the person to eat… Ask the resident permission to look into her mouth to check if she is swallowing or removing leftover food promptly. Aged care costs are rising. With the cost of caring for the elderly increasing, and the population ageing, Australia needs new sources of funding for aged care. In many parts of the world some of the cost is borne by private insurance, and new research shows there is demand for this in Australia as well. There are several models of insurance to help fund aged care. One model is similar to what is found in the United States, where a customer pays an insurance premium each year and the insurance provider then covers (at least part) of the actual cost of getting professional care. But this restricts the customer to getting formal professional care if they become disabled or incapacitated. Another model, somewhat similar to the system in France, has customers paying a premium each year and then receiving cash payments if they require aged care. Under this arrangement the insurer pays an agreed amount of money each year if the customer is disabled or incapacitated. There is no restriction on how that money might be used. This model is more flexible, and allows the customer choice over who provides care (it might be a family member) and where they reside. People now aged 65 have close to a three in five chance of needing some type of formal care over the remainder of their lives and around a two in five chance of spending at least some time in residential care. The cost for this care can run from around A$1,000 each year for basic home support, to around A$65,000 each year for residential aged care. The cost is typically shared between the care receiver and the federal government. Home care supports people to live independently in their own home. This can range from help with housework or managing medicine, to nursing services and palliative care. Residential care is for people who depend on ongoing nursing and includes accommodation in an aged care institution. People on the full Age Pension pay 17.5% of their pension as a basic fee for in-home care, or 85% of their pension for residential care. Better-off pensioners also pay an additional fee that rises with their income up to certain limits. But despite the cost sharing, the federal government’s share is high and rising. Federal government expenditure on aged care is now around 1% of GDP and is expected to rise to around 1.8% by 2050. Around 80% of people who receive some aged care also get informal help, often from family or friends. While this care is unpaid and hard to value, it is likely to be worth around 4% of GDP and can lead to a loss of earnings and emotional strain for the care giver. Insurance could be a solution to the scale, scope and cost of aged care. But in Australia, there is little on offer. Our research shows that a majority of middle aged Australians would purchase aged care insurance in the form of an income stream that pays extra if they suffer ill health. We asked people to choose between several options for funding their aged care. A life annuity (a regular, life-long income of around A$25,000 p.a. including the Age Pension), aged care insurance (paying about A$26,000 in ill health or disability), and an account-based pension (such as superannuation). Men chose to use 25% of their retirement savings of A$175,000 on the life annuity, about 15% on aged care insurance and placed the remainder in the account based pension. Women made similar allocations. Overall, people chose insurance payments that were similar to the actual costs of aged care. Insurance that provides an income rather than reimbursements suits people who prefer informal, in-home care. This is most likely to be women who think they need high level, informal care. Men who thought they would need informal care did not choose the insurance. Women’s willingness to fund informal care with income could be related to an anticipation that they will outlive their partners, a desire not to “be a burden” to their family, an intention to make gifts to children who care for them, or a wish for flexibility and control. Large scale, long term aged care expenses are a relatively recent problem – the outcome of population ageing and rising health costs. Our study shows that many people want help to manage these risks. However the current design and marketing of aged care insurance products present an array of difficult financial and communication problems for the financial services sector.